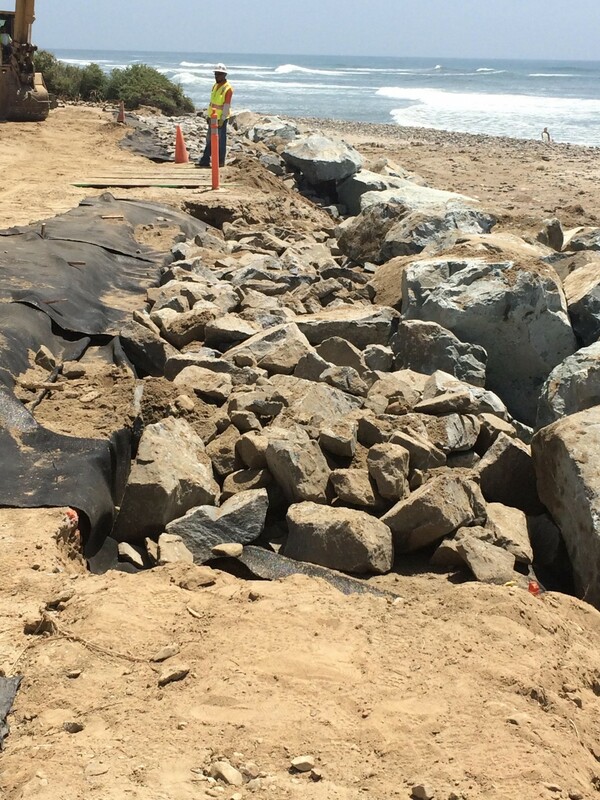 In February, we posted a blog explaining why constructing a 900-foot rock revetment (riprap) on Surf Beach at San Onofre State Park is a bad idea. In case you are unfamiliar with this issue, an access road that leads to a well-used parking lot at Surf Beach, adjacent to the bluffs, was subject to flooding and closure several days during the winter storms, prompting an emergency permit to install a rock revetment. The rock revetment was constructed over several weeks from late April to late May, long after the risk of winter storm flooding had passed. The construction has resulted in at least 20 days of access road and parking lot closure (far more than the number of days closed due to flooding). The revetment consists of 8-ton boulders, placed directly on Surf Beach, substantially reducing the sandy beach area available for beach goers. As you can see in the photo above, the emergency has long passed and the beach has accrued a substantial amount of sand naturally after the winter storms. Surf Beach is suffering from long-term and acute erosion. Surfrider supports maintaining road access to Surf Beach – ensuring access to beaches everywhere is one of our core missions – but to truly maintain access in the face of sea level rise projections calls for long-term adaptation strategies. Unfortunately, we know this revetment is likely to only worsen the erosion and could cause permanent damage to a beloved surf spot and beach. Additionally, increased erosion around the ends of the revetment is likely to lead to a need to extend the revetment in either direction, leading to even more direct impacts to the nearby waves. And although this is only a temporary emergency permit, riprap is costly, difficult to remove and often results in something that’s meant to be temporary becoming permanent. We support a long-term plan that includes maintaining the current road. Given Surfrider’s experiences with coastal erosion and preservation, we see potential solutions to protecting the road without riprap that will negatively impact the beach and surf and likely lead to the need for more seawalls in this region. Instead, we support alternative solutions that work with the coastal processes such as sand and cobble nourishment. We certainly do not want this to be another example of a bad temporary armoring solution becoming an even worse permanent one. If it does, it may cost the public the very beach and waves we desperately want to preserve access to.